Strong storms downed trees and damaged homes in College Park on Monday evening. Three homes are currently considered uninhabitable, prompting city officials to help the residents of those homes find "alternate shelter." See photos. 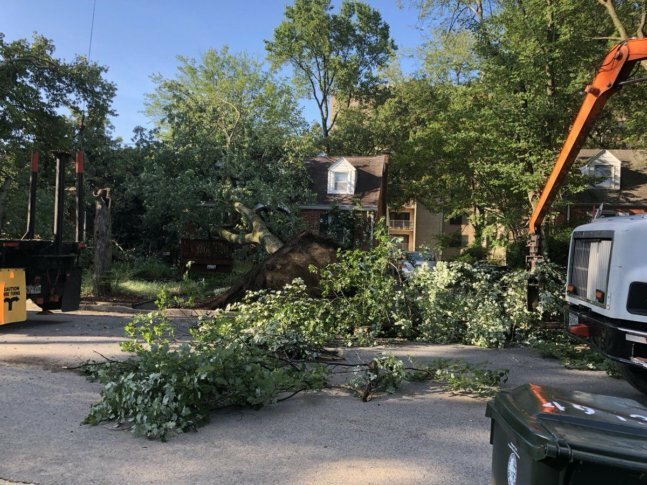 WASHINGTON — The residents of three homes have been displaced after strong winds blew through College Park, Maryland, just after 5 p.m. Monday, knocking down trees and damaging homes in the midst of storms. Prince George’s County Fire and EMS spokesman Mark Brady said initial assessment showed that two homes on Blackfoot Road and Hollywood Road had been declared uninhabitable. Those residents were not injured, but will receive assistance from the county’s emergency management office and the Red Cross, Brady wrote on Twitter. College Park stated that the residents of three homes will be moved to temporary shelter after their homes suffered severe damage. Please stay away from any downed trees & power lines. Parts of Prince George’s County, including College Park, were included in severe storm warnings issued late Monday afternoon by the National Weather Service. Other parts of College Park that sustained damage included Kenesaw Street, Delaware Street, Edgewood Road and Lackawanna Street. To keep up with the forecast, visit the WTOP Weather page.